After finishing as the state runner-up on three separate occasions in their history ('99, '04, '07), Olathe South finally claimed a 6A title last season, going 12-1 and beating Wichita Heights in the championship game. With the 700-pound gorilla off their back, the program can go forward in 2012 with one thing in mind--a repeat state championship. While it won't be easy, Olathe South has hands down the most returning talent and experience of any team in the Sunflower League and they'll be the odds on favorite to represent East Class 6A for the title come November. Lets start on the offensive side of the ball where the Falcons will be led by quarterback Frank Seurer (6-1, 180) who will be in his third season as the team's starting quarterback. He knows the offense like the back of his hand and last season he passed for over 1,600 yards and 12 touchdowns. Other key skill position players include running back Russell White (5-10, 175) and multipurpose talent Matt Elliott (6-1, 185). Leading the charge on the offensive line with be junior Braden Smith (6-6, 285), arguably the league's most highly recruited player ever. Smith will anchor the defensive line for the Falcons as well. Playing behind him will be two of the best linebackers in the state in Remington Whitley (6-0, 210) and Chase Hanson (5-10, 180) who totaled 162 and 107 tackles, respectively, in 2011. 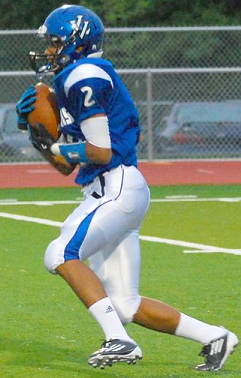 In the secondary the Falcons will be led by Dylan DeVries (6-1, 185), who added 118 tackles last year. Elliott will also play a vital role in the defensive backfield. Olathe South does have some holes to fill, however. They will have to replace All-State center Scott Gourley, big-time receiving threat Drew Johnson, and the combined 2,782 rushing yards and 33 touchdowns added by runnning backs Jordan Ward and Teddy Colbert last season. Still, with the bevy of talent they have returning at key positions on both sides of the ball it's hard to see anyone being favored over the mighty Falcons in 2012. Fast Fact: In 2011 Olathe South became the first Sunflower League team outside of Olathe North to win a state championship since Lawrence won the 6A crown in 1995. You never want to put the expectations of a program on one player, but in all honesty, Lawrence is going to go as far in 2012 as their star quarterback Brad Strauss (6-1, 185) can take them. Let's start with the talented signal-caller. In his two seasons as the starting quarterback at LHS he's combined to pass for 2,695 yards and 21 touchdowns and rush for 1,310 yards and 16 touchdowns. He took the reins at quarterback following Lawrence's tumultuous 1-8 season in 2009 and responded by helping the team to a 3-6 record in 2010. Tyrone Jenkins. Lawrence Journal World. Last year he led Lawrence to a 5-3 record before suffering a season-ending ankle injury late in the year. He was still a first team all-league selection as both a quarterback and a defensive back, but the question remains, does Lawrence risk another injury to Strauss by playing him on defense in 2012? That remains to be seen, but Strauss isn't going to do everything on his own. The Chesty Lions return one of the league's best receiving duos in Erick Mayo (5-10, 175) and Drake Hofer (6-0, 180), both of whom are a threat to take any catch the distance. Running back Tyrone Jenkins (6-0, 205) came on strong late in 2011 and even quarterbacked LHS to victory in the regular season finale against Free State. This year he'll have a good workload out of the backfield and he should be a tremendous compliment to Strauss' running ability. Heading up the trenches will be senior Kharon Brown (5-10, 225), a first team all-league selection last season as a defensive lineman. He's not massive but he plays with great leverage and he has a tremendous motor for getting to quarterbacks and ballcarriers. Fast Fact: Lawrence's 31 undefeated seasons are the most of any high school football program in the country. I know better than to think Olathe East will have an average season just because they lost the bulk of their starters. In fact the Hawks tend to thrive in these years. There are never any guarantees but the Olathe East football program seems to have a formula for successful football that replicates itself year after year. The Hawks do have three notable players returning who will provide the most support for the teams efforts early on. The first is quarterback John Blazevic (5-11, 185), the younger brother of former Olathe North quarterback David Blazevic who helped the Eagles to a state title in 2009. John is a capable passer (albeit his drop back and throwing motion are hardly a thing of beauty) and he led the Hawks to a nine-win season last year, which speaks to his game managing ability. Also returning is running back Hayden Frazier (6-0, 180) who rushed for 489 yards and 7 touchdowns as a junior. He split carries with Kendall Kelly and John Kelsh in 2011, but this year he'll have the majority of the duty to himself. Lastly, kicker Ryan Ahlgren (5-11, 195) returns after receiving second team all-league honors as a junior. Beyond that, there are quite a few unknowns for the Hawks which will need to be mended out in the early portion of the season. But knowing Jeff Meyers' history at Olathe East, that shouldn't be an issue. Fast Fact: Olathe East has had 12 consecutive winning seasons stretching back to 2000, the most of any team in the Sunflower League. 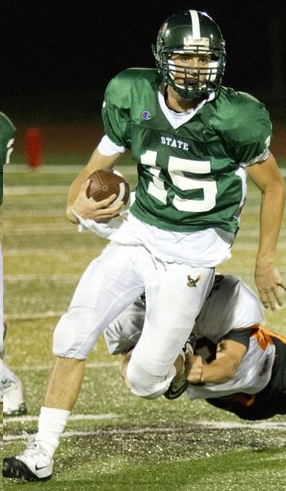 Free State was the first team to bring the zone-read option to the Sunflower League and after seven seasons of running the offense it's safe to say they have it down pat. Year after year the program seems to find the next great dual-threat quarterback in the league. The quarterback for 2012 is Kyle McFarland (6-3, 185), who executed the offense to near perfection in his seven weeks as the starter last year. McFarland isn't a one-trick-pony, however (he was a first team all-league defensive back last year), as he'll help to bolster what should be the best defensive backfield in the league. Flanking McFarland in the secondary will be junior Joe Dineen (6-2, 175) who was a second team all-league selection as a defensive back in 2011 (and also an above average second string quarterback). Good luck throwing the ball against those two. Defensively the Firebirds also will rely heavily on the talents of defensive lineman Cody Stanclift (6-2, 220), a second team all-league performer in 2011, and the defensive savvy of Corbin Schmidt (5-11, 175), a player who seems to have knack for finding the football and making tackles. Fast Fact: In the six seasons since 2006 the Firebirds have had a quarterback rush for over 1,000 yards five times (5/6). In that same time frame the rest of the teams in the league have combined to have a quarterback go over the century mark just three times (3/66). If SM West was ever going to sneak up on the competition this would be the season. The team lost some decent talent from their senior class, but no truly dominant playmakers left with graduation. The returning roster is a bit young but the talent is abound and I wouldn't be the least bit surprised to see them climb up the Power Rankings as the season progresses. Two of the Vikings most notable returning players are running back Brett Sterbach (5-11, 180) and junior lineman Austin Chambers (6-5, 300). Sterbach ran for 1,059 yards and eight touchdowns as a junior, while Chambers earned second team all-league honors as a sophomore on the offensive line. Junior Lee Spight (6-2, 215) will be expected to make big contributions along the defensive line after a stellar sophomore year in which he earned second-team all-league honors. Leading the secondary will be junior Andre Maloney (6-1, 175), a player who showed solid development in 2011. The Vikings' biggest void to fill will be their their quarterback position which was vacated by the graduation of two-year starter Armani Williams. In SM West's offense a gradual development for a quarterback is typical and judging by their successes in 7-on-7 this offseason it looks like they'll at least have a capable passer. More importantly, I think 2012 will be a season in which the program can finally go out and just play football. The awful string of playoff episodes ended last year when they took down Leavenworth and advanced to Sectionals. The roster is budding with young talent and I think SM West will be a fun team to watch once they get past their harsh early portion of the schedule and develop as the season progresses. Fast Fact: SM West has won more Sunflower League championships (13) than any other team in the league. Also, they've won at least one league title in each of the last five decades stretching back to the 1970s. Olathe North is coming off a season in which they absolutely choked away their last four games to effectively eliminate themselves from the playoffs. They lost the majority of their talent to graduation, not to mention their former head coach Pete Flood who led the program to a state title in 2009. Only one thing could make the the Olathe North faithful look past all of that--Gene Wier's arrival as the "new" head coach. The timing couldn't have been better, quite frankly. The Eagles are going to be a young and inexperienced team in 2012 but that will probably play into Wier and the program's hand as the season progresses and into the future. In terms of skill positions some names to keep an eye on include athletes Dontez Sanchez (5-7, 175), Kai Rowden (6-1, 200) and Venus Triplett (5-9, 165). Lineman Sean Ceballos (6-0, 225) and Ryan Garrett (6-3, 215) will provide veteran stability in the trenches going forward. Overall, the most interesting aspect of Olathe North in 2012 will be how quickly the program is molded to Wier's standards. That may not even be this season or the next, but the process will begin this fall. Fast Fact: When Gene Wier left Olathe North to coach in Texas following the 2002 season Olathe North was truly a dynasty. The program had won six of the last seven 6A titles, maintained a 38-game winning streak and was ranked 24th in the nation by PrepNation. *Weir's 22 previous years with Olathe North stretched from 1981-2002. Jordan Darling. Kansas City Star. The Sunflower League is quite simply more fun when SM East is doing well. I'm confident they've produced more story lines per capita than any team in the league the past three seasons. Looking forward to 2012, the team returns a solid core of players plus one transfer that should keep them in contention for a league title, so don't be fooled by the seven spot. The headliner and the player everyone is waiting to see is quarterback transfer, Jordan Darling (6-4, 235). Darling played at football factories in Ohio and Texas the previous two seasons and his impact on the Sunflower League should be a significant one. He's already committed to play at Kansas which will allow him to maintain complete focus on the upcoming season as opposed to having to deal with his recruitment on the side. His main target will be receiver Connor Rellihan (6-2, 180) who caught 48 passes for 811 yards and 11 touchdowns as a junior. Leading the defense will be linebacker David Stewart (6-1, 215). Stewart was a second team all-league selection last season and he's a physical player with great speed to the boundaries. Those three are the early headliners for the Lancers but you can bet at least a few more receivers will become well-known commodities with Darling distributing the football. If Darling can live up the hype then SM East will have the ability to beat any team in the league in 2012. Fast Fact: Despite the ho-hum reputation prior to 2010, SM East has only had five seasons of less than four wins in the past 14 seasons. Typically the second year under a head coach is when you really start to see the coach's impact on a program. SM South only won two games last season but for the first time in a long time they were actually a viable threat to pull an upset here and there. Their progression should be more evident in 2012 as they look to finally knock down the .500 hurdle they've been looking up at for over a decade now. For starters, they have a ton of returning experience. Demetrius Berry. Lawrence Journal World. It will all start with their talented running back Gabe Guild (5-10, 190), who was a first team all-conference performer last year after putting up over 1,600 yards rushing. He'll be running behind the junior twins, Dominique (6-3, 265) and Demetrius (6-3, 265) Berry. Both players earned their stripes along the line for the Raiders as sophomores and both offer great size and ability up front. Junior tight end Nick Oliver (6-5, 210) could become a formidable receiving threat for the Raiders as the season progresses. Defensively the Raiders have a solid core to build off of as well. Junior Ra'Keim Abdul (6-1, 175) will be the leader in the secondary after his solid sophomore campaign. He'll likely be flanked at the opposite cornerback position by John Eric Kelly (5-10, 175) or sophomore Dainan Swoope (5-10, 170) who was one of the few freshman in the league to see playing time last year. Jeramie Fischer (6-0, 215) will lead the attack from his linebacker position after having recorded 87 tackles as a junior. Head coach Ryan Lonergan's team took some lumps last year playing young and inexperienced talent but that move should start paying dividends this upcoming year. 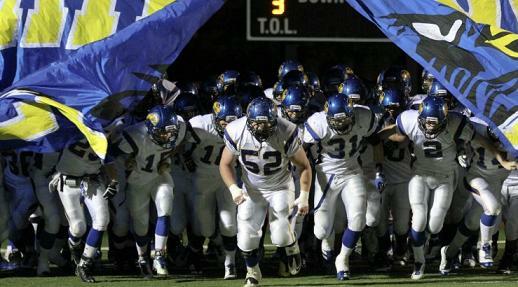 Fast Fact: Last season SM South lost their first three games by a combined 10 points, including an overtime game. Reverse those outcomes and they would have finished 5-4. The Pioneers have a solid core of returning talent and they should be competitive in year three under head coach Kevin Kopecky. The last time Leavenworth recorded more than two wins in a season was in 2004, but that streak should be broken come this fall. The player to keep an eye on is junior running back Jason Randall (5-11, 180). He's been a starter for Leavenworth ever since his freshman season and with 19 starts under his belt he's as experienced as any player in the league. Last year he rushed for 822 yards and 11 touchdowns on 145 carries in addition to catching 26 passes for 302 yards and two scores--efforts which earned him second team all-league honors. Two other players of note include offensive lineman Nathan Butler (6-4, 230) and defensive end Jacob Roberson (6-6, 200), both of whom were second team all-league selections last year. The two players will provide great punch up front for the Pioneers on both sides of the ball. The leader in the secondary will be sophomore Isaiah Ross (5-11, 160) who tied for fourth in the league in interceptions last year with four. Ross might also be the fastest player in the league this upcoming year with a legitimate sub-4.4 forty. Other players who return after honorable mention seasons in 2011 include quarterback Judson Cole (5-9, 165), wide receiver Eli Keppler (5-8, 160) and defensive tackle Jesse Colver (6-3, 230). Fast Fact: Leavenworth has been a member of the Sunflower League since 1981, but in their 31 seasons as a member they have never won a league title. This upcoming season is really going to be a gut-check for the Olathe Northwest football program. It's not going to be easy to duplicate the successes of 2011 where they crushed rival Olathe North in the season finale to advance to the playoffs. Gone are three of the most outstanding players in school history--Connor Middleton, Willie Cauley and Dalton Rook--with no clear replacements set. Fast Fact: In its eight-year history Olathe Northwest has never had a winning record. However, they have qualified for the playoffs on three occasions ('06, '09, '11). It's such a cliche, but this will truly be the dawning of a new era for SM Northwest football. Gone is the former head man, Aaron Barnett, who coached the team from 2006 through 2011, and replacing him is seasoned veteran Linn Hibbs, who previously enjoyed great success as the head coach at Wellington High School. Player wise, things are also completely new. 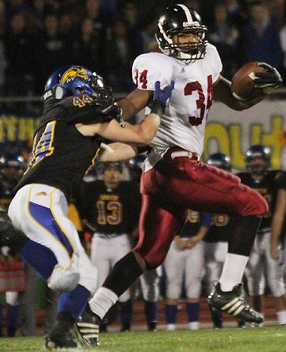 The Cougars had just five players who earned second team of honorable mention honors in 2011, and they were all seniors who have since graduated. Hibbs will have a young, inexperienced team on his hands, but given the circumstances of his out-of-town arrival it may not be such a bad thing. Hibbs will be able to develop the team in his own manner, because after all, the team doesn't return any star players so everyone will virtually be starting from scratch under the new coaching staff. Hibbs has a long history of success and I'm sure the Cougars will be an interesting team to watch by season's end. Fast Fact: Three SM Northwest alumni were in the NFL last season. Offensive guard Ryan Lilja started for the Chiefs, running back Ryan Torain played for the Redskins and linebacker Mike Rivera was a member of the Patriot's practice squad. SM North is another team with relatively low expectations in 2012, mostly due to the fact that they don't return much talent and they haven't been successful the past couple seasons. 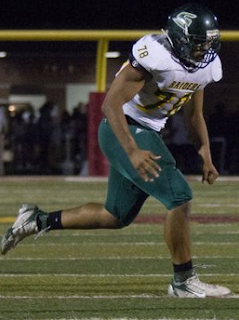 The Indians most notable returning starter is lineman Armando Contreras (6-1, 210). Contreras is solid on the wrestling mat and it showed last season when he was one of the Indians best players. Beyond Contreras the team is inexperienced much like many of the other teams on the lower end of the Power Rankings. It's going to be an uphill challenge for SM North to suddenly turn things around this season but we know they'll put up a good fight regardless of the circumstances. Fast Fact: Since Sam Brown left his post as head coach following the 2004 season the Indians haven't won more than three games in any one year. Disclaimer and Footnotes: All player names are accompanied by their heights and weights. Current players whose classification's are not listed, are seniors, while classification is provided for all those players who are not going to be seniors (i.e., junior Braden Smith). Many times players move or transfer during the offseason and for this reason it's extremely difficult to be 100% accurate when listing notable returning players. The process for the Power Rankings begins at the conclusion of the previous season, but the actually writing this year began sometime in mid-May. Olathe South was the hard and fast top pick from the get-go. The Falcons were the most obvious preseason top pick I've seen in the league since I began the Power Rankings in 2009. The hardest part this year was allocating teams #2 through #7. Quite frankly this looks like it's going to be an extremely competitive year and placing the teams in that range was very challenging. I also found the juxtaposition of SM East and SM South at spots #7 and #8 quite intriguing for both on and off the field reasons. I also know they got a new defensive coordinator from Sm West. Heard he is really good. You know anything about that? Thanks for the correction. And I hadn't heard about any coordinators from SM West leaving to join SM South's staff this offseason. What's the coach's name? He the old dc from Olathe north too. I think it is phrase. I think this is a very good Initial listing. I could see SM West moving up the charts to a top three spot by the end of the year. Verified that it's coach Frase. I played under him during my time at SM West and he's truly a great coach and football mind. He's flown under the radar with the masses simply because he's never been a head coach in the league (not because of lack of opportunity but because of his own preference to remain a coordinator). He has a great pedigree, having served as defensive coordinator with Olathe North in their dynasty years and then with SM West during the mid to late 2000s. Hard to see SM South not breaking the .500 barrier with the staff they have assembled plus the experience of their players. I think this list will look quite different by seasons end. There will be a lot of contributions made by incoming juniors and sophomores on a few of these teams. And some teams will be better just from the old axiom "Addition by Subtraction". And a couple of teams starting line ups will be very different by the end of the season and not from injuries alone. Lastly, IMO, this league does NOT have even one suspect Head Coach at this point. I am sure this will be an exciting NEW year in the Sunflower League.